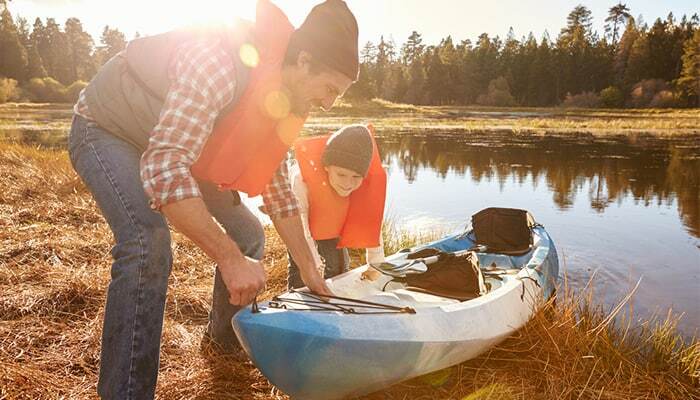 Ready to ride the waves or head out on your first paddling adventure? 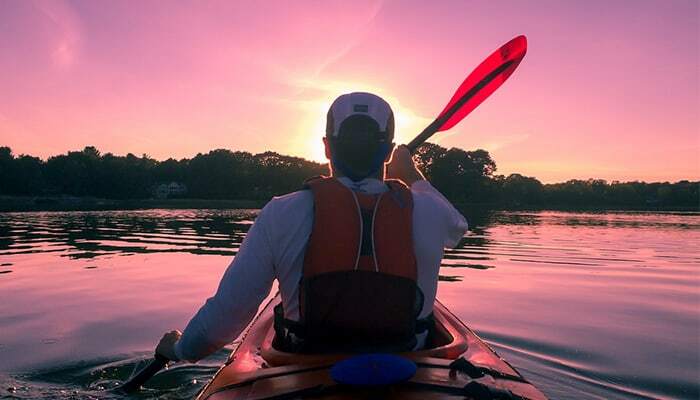 Whether you’re a kayaker, canoer, or stand up paddle boarder, you’ll need a personal flotation device (PFD) to keep you safe (and legal). 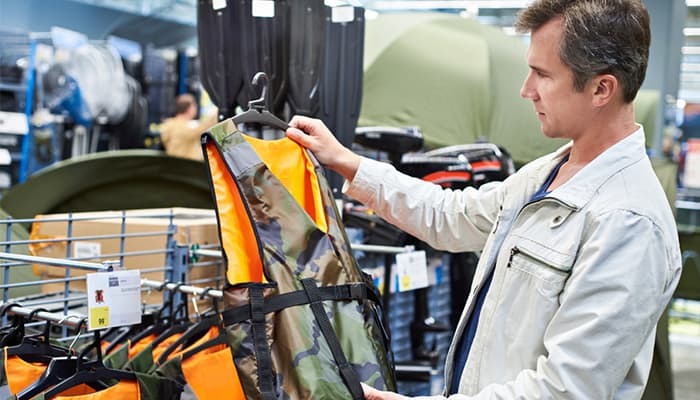 When perusing your options, be sure to look for a U.S. Coast Guard-approved PFD. While there are many different types of PFDs, let’s dive into the models used for the water sports listed above. You’ll need to decide between a traditional PFD or an inflatable model. Let’s take a look at the similarities, differences, and which one is right for you. 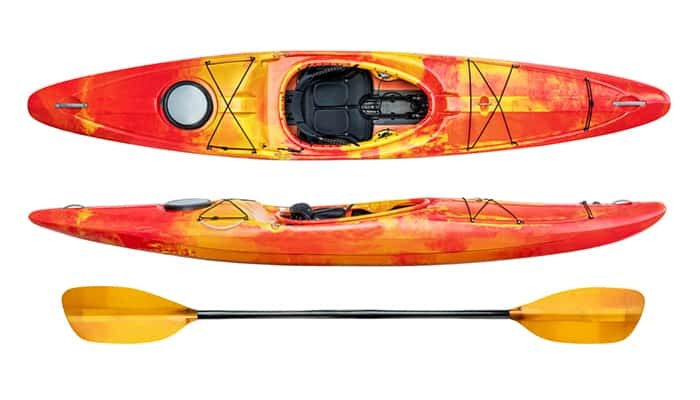 As you will quickly notice when shopping for a PFD, most models are standard. This type looks just like a vest and is made from foam or another flotation material which helps you float in the water. You’ll find this option labeled with the following: Type III USCG-approved PFD. They’re easy to care for: Simply clean after each use, and keep them out of direct sunlight. 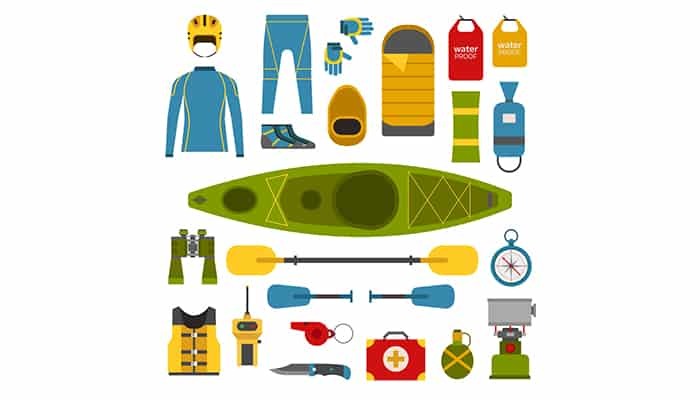 They can be used for a variety water activities: No matter which water sport you’re taking part in, chances are you can use your standard PFD. They don’t require activation: Just put it on and hit the water. They have pockets: The majority of standard PFDS include pockets for toting snacks, cash, and other necessities. They can be restrictive: Standard PFDs can make it difficult to paddle. Some folks also complain that they’re bulky. 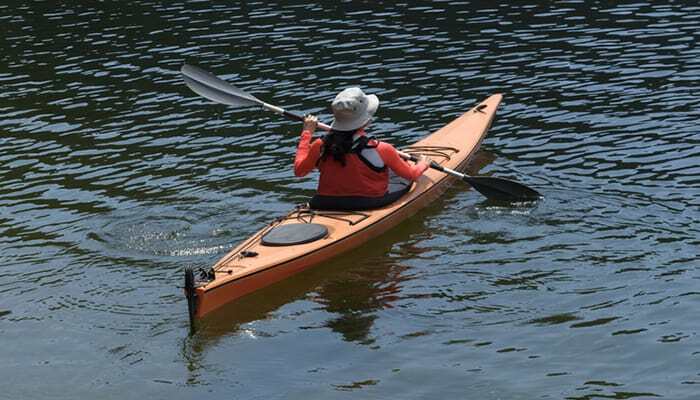 They can make it hard to keep cool: This type of PFD can make paddlers uncomfortably hot. Many paddlers swear by inflatable PFDs. They come in multiple forms, including vests and waist packs, and they are popular for their versatility and comfortability. You’ll find them labeled with the following: Type III or Type V USCG-approved PFD. When shopping, you’ll have the choice between a manual or automatic version. Manual inflatable PFDs require the user to pull a cord to activate the gas which inflates the device. If you opt for an automatic model, the device will inflate when submerged in water. Note: We recommend manual PFDs for the majority of water sports. They’re comfortable: Paddlers love the slim design and comfort level while paddling. They keep you cool: Unlike standard PFDs, inflatable versions keep paddlers cool since they tend to be smaller. They have to be inflated: This type of PFD will only float when inflated. Because of this, standard PFDs can be a safer option for water sports. They’re not as user-friendly: Inflatable PFDs require maintenance, and the CO2 cartridge must be replaced after every use. They’re not always a good option: It’s important to note that inflatable PFDs aren’t the best option for some activities, including high-impact water sports. If you’re going to be water skiing, or plan to be on whitewater, opt of our inflatable versions. 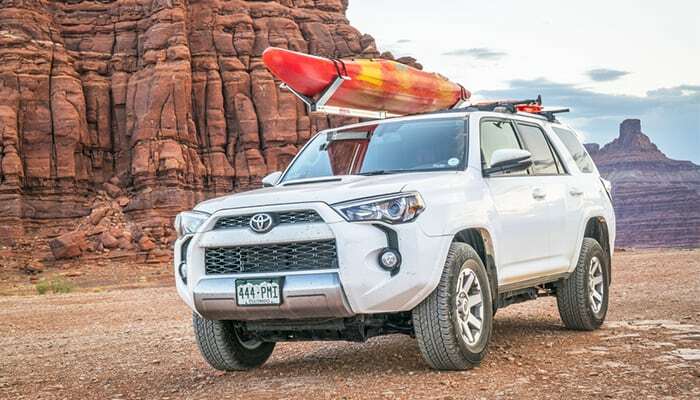 You may spot a handful of hybrid PFDs on the market, which are intended for kayaking, stand up paddle boarding or canoeing. These versions combine elements from both standard and inflatable models. They’re buoyant, compact, and comfortable, making them an attractive option. Keep in mind that hybrid PFDs are pricier than other versions. 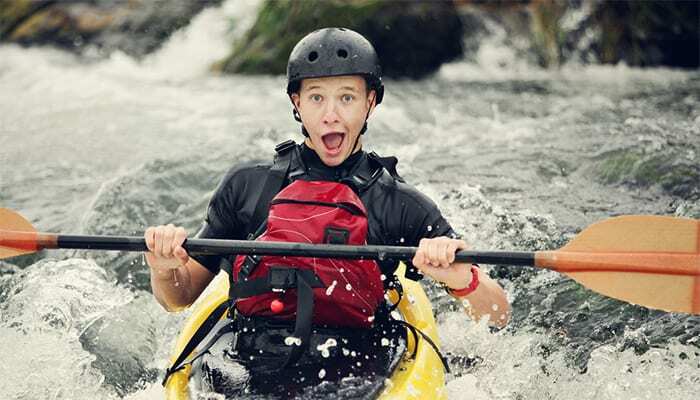 It’s imperative that you choose a PFD that fits. You’ll find tips and tricks for the perfect fit below, both for adults and children. Your chest size determines which PFD size you need. For kids, however, you’ll need to go by their current weight. To accurately measure your chest, use the measurement at the broadest point. Once you have your measurement, simply find the suggested size provided by the PFD manufacturer. When trying out PFDs, wear similar clothing to what you’ll be wearing on the water. Note that more straps mean a more customized fit. 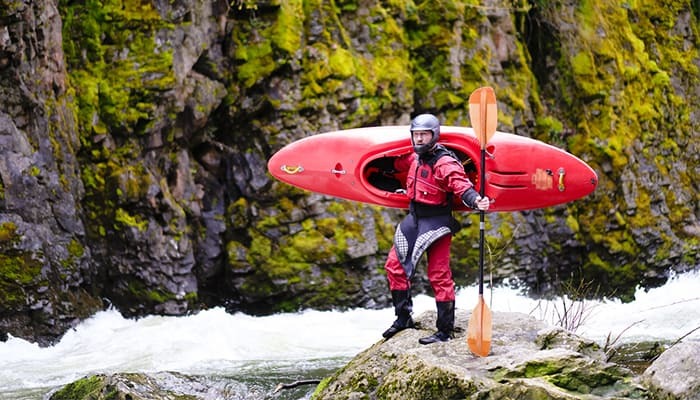 Practice paddling while wearing the PFD. Keep in mind that shorter PFDs often work best for kayaking. Try out your PFD in shallow water to ensure it doesn’t ride up, feel uncomfortable, or slip out of place. For women, look for female specific PFDs for a better fit. If you opt for a standard PFD, loosen the straps before slipping on the device and zipping it up. If you have an inflatable, secure the pack around your waist, or if it’s a vest, slip it on over your head. Be sure to tighten each strap, starting with the waist. Shoulder straps should be tightened last. The device should fit snugly. When using a standard PFD, ask a friend to pull up at the shoulders. The device shouldn’t move too much. If it does, tighten the straps. If it continues to move, opt for a smaller size. You should be able to move freely, and your PFD should not cause chafing. Make adjustments as needed. Just never take off your PFD on the water. Unlike adult PFDs, you’ll need to use your child’s current weight to determine the right size. There are 3 categories for kids: infant, child, and youth. Infant PFDs fit babies and toddlers between 8 and 30 pounds. Child PFDs fit children from 30 to 50 pounds. Youth PFDs fit kids between 50 and 90 pounds. For babies and small children, padded head support is key. Make sure that the device has a grab handle for emergencies. A crotch straps keeps the device from riding up. Allow your baby or child to wear the device at home before venturing out on the water. Small children aren’t fond of PFDs. A few trial runs (and rewards!) should help. If your beloved pooch will be joining you on the water, you’ll need to pick up a dog-specific PFD. Even if your pup is a fantastic swimmer, a PFD is a necessity. Note: Dog PFDs are not certified by the U.S. Coast Guard. Look for a device that fits snugly. You don’t want your pup to shimmy his way out of it. Pick up a PFD with easy-release buckles. Make sure the device has a handle so you can lift him from the water. So, why do we need PFDs in the first place? These devices provide buoyancy to keep folks safe in the water. Buoyancy refers to force in pounds that is needed to keep an individual’s head and chin above water. Adults typically need about 7 to 12 pounds of flotation to keep them afloat. You’ll find that the majority of models are within this range. To test a PFD’s buoyancy, put it on and submerge yourself in water you can float in without touching the bottom. Relax your body and tilt your head back. Note that your chin should be above water and you should be able to breathe easily. Bright colors, making you easy to spot. Plus, they’re fun to wear! Pockets, for toting snacks, sunscreen, and other necessities. Ventilation, for breathability. This feature is especially beneficial in hot climates. Tabs, for attaching a whistle, knife, and other accessories. Reflective tape, ideal for low-light conditions. Extras for fishing, including rod-holding loops and a foldable pocket table. Type I PFDs – Intended for rough waters and/or for those traveling to remote waters, these PFDs offer plenty of buoyancy and promote a face-up position when the wearer is unconscious. Type I models tend to be cumbersome and are often found on commercial boats. They are available in standard, inflatable, and hybrid models. Type II PFDs – Ideal for calm waters, type II devices are basic and tend to be inexpensive. They are best for areas where a quick rescue is likely. They are not as successful at turning unconscious wearers face-up as type I models. This type comes in standard, inflatable, and hybrid designs. Type III PFDs – Popular among water sports enthusiasts, type III models are comfortable and allow for easy movement. Wearers must turn themselves in a face-up position and tilt their heads back for best results. They are available in standard, inflatable, and hybrid models. Type IV PFDs – Intended for emergencies, this type of PFD is used in addition to a primary PFD. Life rings and buoyant cushions are in this category. This type of device isn’t meant to be worn. Type V PFDs – These special-use devices are intended for specific purposes. The USCG states that the device must be worn at all times for the intended activity, which is specified on the label. This type of device comes in inflatable and hybrid variations. They can be found for sports such as kayaking, windsurfing, and waterskiing. 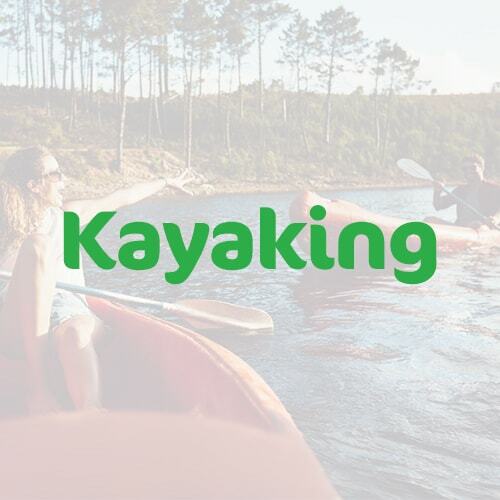 Still getting your feet wet while venturing into the world of kayaking? 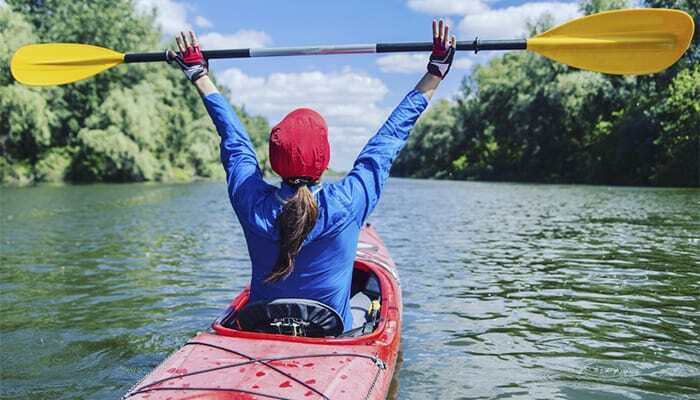 Check out the Ultimate Beginners Guide to Kayaking for insider tips on the sport.